If you're looking for some great Golf History Trivia or want to know some interesting golf facts, read on. Does Ireland or Scotland have the most golf courses per capita? What is the origin of the word caddie? Is St. Andrews the oldest course in the world? Insurance actuaries have calculated the chance of an average golfer making a hole in one at approximately 12,500 to 1, and the odds of a tour professional at 2,500 to 1. The chance of two holes in one in a single round are approx 67 million to 1. Tiger Woods was only 8 when he got his first hole in one. Balls travel significantly further on hot days. 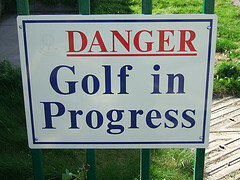 The four major events in professional golf are the British Open, the Masters, the U.S. Open, and the PGA Championship. The four events together are called the Grand Slam of golf. No player has won all four grand slam tournaments in one year. Tiger Woods came the closest winning all four consecutively over two years. The longest golf course in the world is the International Golf Club in Massachusetts. It is a par 77 course measuring 8325 yards. The longest golf hole in the world is the 909 yard 7th hole (par 7) of the Sano Course at the Satsuki Golf Club in Japan. The Ryder Cup is the most famous team golf event. It is played every two years between a team of European golfers and a team of American golfers. There are 336 dimples on a regulation golf ball. The dimples have been discovered to reduce turbulence and allow the balls to travel further. Golf balls were originally made of thin leather stuffed with feathers. The Lowest Score for a round of golf in the world is a 57. Wayne Meyers of Easley, S.C. was the hero at Southern Oaks golf course in Powdersville, South Carolina, USA in 1994. The 5 year old Coby Orr was the youngest golfer to shoot a hole-in-one. He did it in Littleton, Colorado in 1975. In 2006, Russian astronaut Mijail Tiurin, according to the Guinness Book of Records, was the first person to drive a golf ball in space. Ab Smith, an American golfer, described an excellent shot of his as a ‘bird of a shot’ in 1899. This later became ‘birdie’ giving us the term. A 'birdie' was one shot less than par for a hole. One better than that, and something more rare than a birdie was an 'eagle', meaning two under par for a hole. Continuing is this bird theme an 'albatross' for its rarity was three under. In 1457 King James II banned golf and soccer in Scotland because they distracted military personnel from pursuing archery, more suited to their profession. Scottish Golf History records King James IV as the first recorded monarch to have purchased some golf clubs. St. Andrew's in Scotland is not the oldest golf course in the world. The Guinness Book of Records records Musselburgh Links course as being played as early as 2 March 1672. However, some evidence exists that Mary Queen of Scots may have played there as early as 1567. The Gentlemen Golfers of Leith (1744) is also considered to be the first official golf club. It was later renamed the Honourable Company of Edinburgh Golfers. Ten Years later, the St Andrews Society of Golfers was formed following Leith's rules. King William gave St Andrew's the title the 'Royal & Ancient' in 1834. St Andrew's, however, has had the greatest effect on the origin of golf. It's course was initially built with 22 holes but these were later reduced to 18. New courses followed suit and it became the standard. At St Andrews the size of the hole was set at 4.5 inches. This too was copied by other golf courses. Tom Morris, a successful Scottish professional golfer, was a pioneer in course design in the 19th Century. He is credited with inventing the first dogleg. 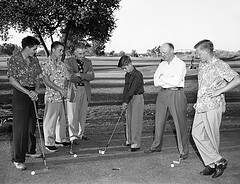 Golf is often considered related to the Belgian game Chole and the Dutch game Kolven. Both are stick and ball games but you do not have to get the ball into a hole in either - the real golf challenge. The origin of golf term ‘Caddie' comes from Mary Queen of Scots use of French cadets to help her play while she studied there. The first International golf match is believed to have taken place near Edinburgh on the course of Leith in 1682 when two Scottish noblemen beat two English noblemen. The first golf club outside Britain was built in the city of Bangalore in India in 1820. The first golf club outside Britain that was built in Europe was at the Curragh in Ireland in 1856. By 1900 there were more than 1000 golf clubs in the US. The first golf club heads were made of beech or the wood of fruit trees such as apples. Golf club shafts were originally made of hazel or ash wood. 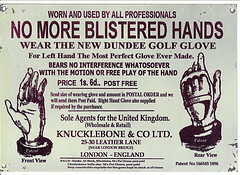 Make sure to check out our Origin of Golf page for a brief Scottish Golf History.